Client caching enables you to reduce the amount of bandwidth required at the startup of the Unified Service Desk client on the call center agent’s computers, and over the lifecycle of the client application. Client caching provides a means to cache the majority of Unified Service Desk configuration data locally on the call center agent’s computer, thereby reducing the need for common data to be retrieved from the server. This capability provides a noticeable increase in the startup performance of Unified Service Desk. 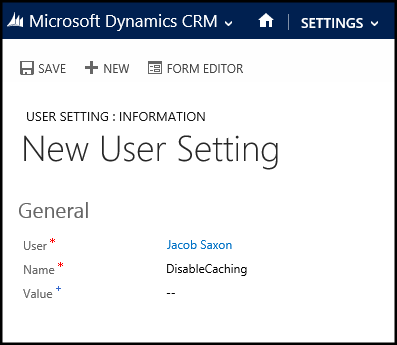 This feature has privacy impact because enabling client caching in Unified Service Desk leads to some of your data being stored locally on the user’s computer, which is outside the Microsoft Dynamics CRM services boundary. When should you use client caching? Client caching can provide a significant improvement in startup times, a reduction in overall bandwidth, and a significant reduction in queries to the CRM server for common Unified Service Desk data. Client caching is best employed in performance testing, training, and production environments. It isn’t recommended for development environments because changes are only replicated when the control cache key is updated. The Options and User Settings entities are queried for the startup keys to determine if client caching is enabled. If it is enabled, resolve client cache version number and any cache modifications. If client caching is enabled and a version number is available, locate the local cache store and determine the cache version key. If cache version number is current, decrypt and load the cache store into memory. If the cache version number is incorrect, delete the cache object. Sign in to Microsoft Dynamics CRM. Click New on the command bar to create a new option. For the new option, type ClientCacheVersionNumber in the Name box, and an alphanumeric number in the Value box. The alphanumeric value is used as the cache key for Unified Service Desk. When the option is present and populated, Unified Service Desk will activate the client caching. For example, for a user called agent1 running the client application on Windows 8, the client caching files will be available at c:\Users\agent1\AppData\Roaming\Microsoft\USD. Information in this directory can only be accessed by the user account that created it. To push an update to all the Unified Service Desk clients, you must edit the value of the ClientCacheVersionNumber that you created earlier to a different alphanumeric value. Next time when a call center agent logs in using the Unified Service Desk client, it will detect the different value for the ClientCacheVersionNumber option key, and read all settings from the server before starting up. At times it may be necessary to exclude some users from client caching such as limited testing of new configurations in production, production, or troubleshooting where a cache problem is suspected, or the need to do rapid updates to a configuration where you want to revert your changes back to the currently cached objects. Click New on the command bar to create a new setting. In the User field, type or select the name of the user for which you want to disable client caching. In the Name field, type DisableCaching. Leave the Value field empty. When the user next signs in using the Unified Service Desk client, client caching isn’t used. However, it doesn’t delete or refresh the client cache store for the user. When the DisableCaching key is removed for the user, the user will return to using the previously stored client cache store. At times, it may be necessary to force a cache reset for a specific user to clear and reset the cache store. You can do this in two ways: From the CRM server or by using the Unified Service Desk client application on the user’s computer. In the User field, type or select the name of the user that you want to disable client caching for. In the Name field, type ResetDesktopCache. Leave the Value field empty. This causes the Unified Service Desk client application to delete its local cache store and rebuild it from the server when the user uses it next time to sign in. You can invoke a reset from the client application using a hidden UII action called ResetLocalCache on the Global Manager hosted control type. You’ll need to create the UII action on the Global Manager hosted control type before you can use it. Locate the CRM Global Manager hosted control, and click its name in the Name column to open it for editing. On the nav bar, click the down arrow next to the CRM Global Manager hosted control, and then select UII Actions. On the next page, click Add New UII Action. On the New UII Action page, type ResetLocalCache in the Name field, and then click Save. Close the UII Action and the hosted control. Next, we will add an action call to call the UII action that we just created. On the nav bar, click Settings > Unified Service Desk > Action Calls. On the action calls page, Click New. In the Name field, type ResetClientCache. In the Hosted Control field, specify the CRM Global Manager. In the Action field, specify ResetLocalCache. Click Save and then close the action call. After you have setup the UII action and the action call, you can add a toolbar button, event, or code to directly invoke the action call from the client application. This creates a RestDesktopCache setting in the User Settings area, which triggers the reset behavior as described earlier in Using the CRM Server. © 2015 Microsoft. All rights reserved.